This is held each year by the Lions Club as a fund raiser for charity at the airplane section of Motat opposite the zoo, the hangers are open and you can look at the planes stored there. They have displays of stationery engines, a swapmeet, a band plays during the day and lots and lots of cars come from all the various car clubs right from the early 1900’s. This year there were a large number of cars probably to the brilliant sunny weather with almost no wind the gazebo’s were up in force some years we have not been able to erect ours owing to the stiff breeze blowing. We held the first committee meeting under it later in the day most of the committee were present, also some of the club members. The steam train was operating during the day taking children and adults back in time with a short ride the stretch of track is not long but I notice that the extension to the tram track is almost open it will go from the main buildings of Motat on Great North Road along almost to the zoo gates before going across Motions road down to the main hanger in the airplane section lights have been installed on Motions Road which I presume will stop traffic as the tram crosses. Martin brought the swapmeet parts from the Parts Shed and set them up along with his pieces and Bud helped him most of the day, the club selling about $75 of odd parts people had donated along with Ford spares. Thanks to Martin for collecting up and bringing them in and taking unsold parts back. 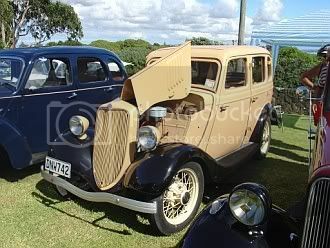 We had a good range of vehicles there this year, more Prefects than others but different cars than other years which was good, a lot of people looked at them and George a member from Kaitaia took a club application form for a person up there who has just acquired one. Dennis Owens’s 1946 Ford 10 made it under it’s own stream this year it broke down on the way last year, he has a collection of cars of various types. 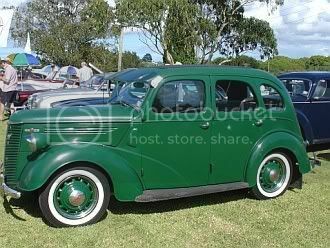 We did not win any of the presentations this year John was hoping his 1949 Australian Anglia Tourer might win one. But there were a lot of cars there this year more than usual.